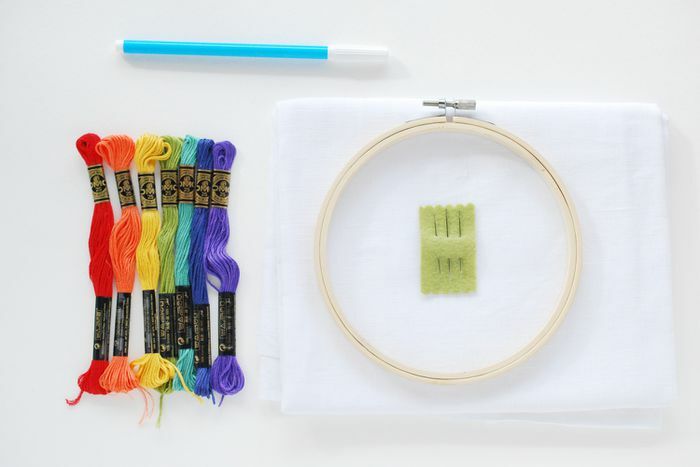 If you want to give embroidery a try, but have been intimidated by the different supplies and the vast number of stitches and tutorials, this quick-start stitching guide is for you. This easy overview is also helpful for if you're introducing a friend to stitching and want to make sure you cover the basics. Learning embroidery doesn't have to be difficult, and it definitely shouldn't feel like a huge investment of time and money. It's actually an easy and inexpensive hobby to jump into! But to get started, you only need ​​a basic pattern for beginners and a few things. Select a few colors of cotton embroidery floss. DMC brand is easy to find, inexpensive and good quality. Avoid floss designed for craft projects (such as friendship bracelets), as it will be frustrating to work with. There are many styles of embroidery hoops available, but all you need to get started is a basic wooden or plastic hoop. A 6-inch hoop will serve you well for a variety of projects. Like hoops, there are many kinds of embroidery needles out there. Any sharp needle with an eye large enough to thread embroidery floss through will work. However, the easiest thing is to choose a pack of different sizes of sharp needles labeled for embroidery. Depending on your project, there are a few ways to transfer a pattern to your fabric, but tracing is the simplest. A regular pencil will work, but to ensure that you don't leave any stray markings, use a water-soluble pen. There are scissors made for different tasks in embroidery, but before you buy anything fancy, it's okay to use any scissors you have around. Just be sure that they will cut the floss easily so the ends aren't frayed. This simple stitch is so basic you probably already know how to do it without even learning it. Making short straight lines is something you'll do a lot as you embroider. For doing any kind of outlining, back stitch works and it's so easy. Focus on making each stitch the same length and you'll have something that looks really great! If you want to learn the best way to start and stop, there are some special techniques to follow. But it's also okay to start and end with a knot. When you're done stitching, your embroidery may need to be rinsed or soaked to remove markings. This also helps remove wrinkles. When it comes out of the water, gently press away excess water with a towel. Then place the embroidery on a folded towel and press from the back with an iron. You're now ready to get stitching! With just a bit of practice, you'll be feeling confident and ready to move from simple patterns to more complex. And once you've mastered a couple stitches, you can learn a few more, such as french knots and detached chain stitch.